Bentley's Pub is a downtown bar with a neighborhood vibe. We'd love to be your new go-to spot for craft beer and cocktails. Bentley's Pub has had a long history in downtown Champaign. It started as Ole Ace's in the 70's and has since transformed into Bentley's in the 90's. Much of the history can still be seen in the original tin ceilings, original bar and foundation. 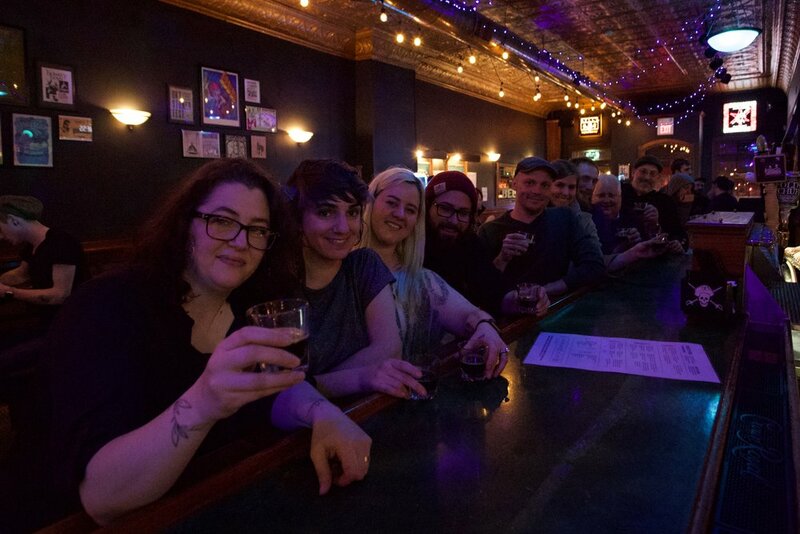 But as of June 2016, owners Ashley Buerkett and Eric Meyer are working to revamp a few things while still trying to keep the original charm and history of the space. We began with the drink menu. Our General Manager, Matt "Fu" Kucera has been a bartender in the area for years and has worked hard to create an amazing array of house-infused cocktails, also known as InFUsions. We also offer many other seasonal craft cocktails and an ever-changing list of craft beers. But if that's not your thing, we have a full bar complete with PBR, Jameson, Fireball, BudLight, and all of the classic options that will never go out of style. Half off white lie shots and drinks. We also feature 2 dollar Budweiser, Bud Light, Coors Light, Michelob Ultra and Miller Light. Myers's dark rum, fresh lime and ginger beer. If you are interested in planning a party or event at Bentley’s please fill out the following form and we will get back to you as soon as we can! If you want a private event, you will have to hire a door-person (we are happy to make a recommendation), provide them with a printed guest list, and you will be required to hit a minimum in sales for the duration of the event. This minimum is determined by the day and time (i.e. a Tuesday from 6-8 would be less expensive than Friday 11pm-2am). If you agree to this amount, you must hit your minimum target. If you fall short you must pay the difference by the end of the event. REGARDLESS OF A PRIVATE OR PUBLIC EVENT, EVERYONE MUST BE 21 OR ABOVE! THIS MEANS NO BABIES OR SMALL CHILDREN! If you do choose to bring in food, please remember to bring utensils, cups, napkins, plates, etc. Please note if you want the event to be private, you will need to hire a door-person and also provide them with a printed guest list. We will also email you with an amount you will need to hit in sales. If you do not hit your amount you'll need to make up the difference before the end of the event. As in, will you be bringing in a playlist, hiring a DJ or hiring a karaoke service? If so, the party MUST be private. By checking this box you accept that we are STRICTLY a 21+ bar. That means no babies or young children.